Planning your Cambodia trip? From unique architecture and cultural flair to culinary delights and an inspiring NGO, unearth the charms of authentic Cambodia. The Angkor Wat Temple Complex in Siem Reap is every history enthusiast’s dream. Inspired by traditional art and decorated with Cambodian fabrics, Angkor Village Resort & Spa in Siem Reap is a tranquil oasis for tired travelers to the famed temple complex. 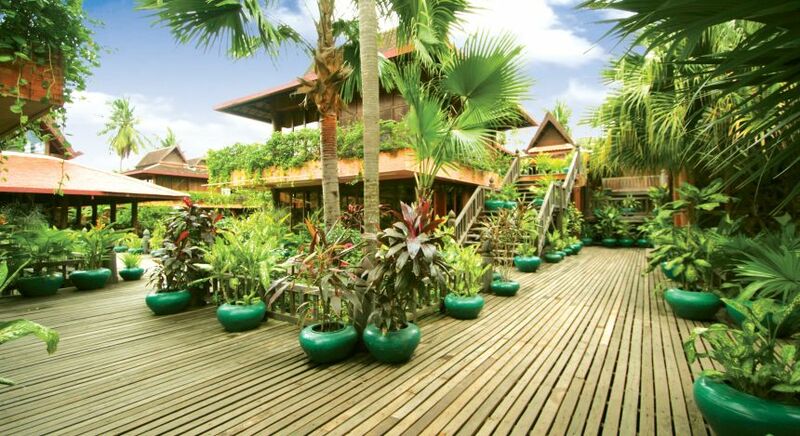 Step into a verdant tropical oasis nestled strategically on the path to the famous temples of Angkor Wat. Angkor Village Resort & Spa artfully blends authentic Khmer design with modern luxury, boasting lush green gardens, serene terraces and wonderfully relaxing views. What is most unique and relaxing about Angkor Village Resort & Spa is the irresistible invitation offered by the sparkling swimming pool that meanders around the vast resort. 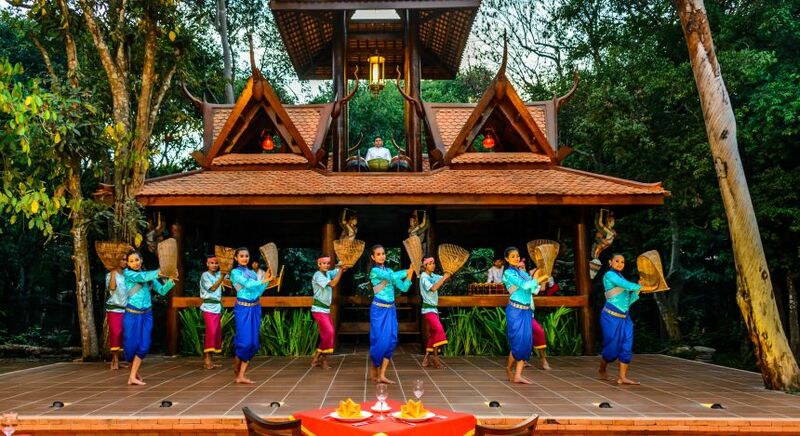 The resort invites you to step back in time and experience ancient Khmer culture through cultural performances held by talented local artists. Any discerning guest knows that it is not only the sights but also about truly immersing yourself in the culture of the country you are visiting! What better way to do this than with personal encounters that enrich your journey and the communities you are visiting? It is often difficult to understand all the facets of a place through observing everyday life on your vacation; it is by going deeper into the hearts of local people – and we believe there are plenty of opportunities. The Apsara Arts Foundation is one such. The ancient Cambodian tradition of the graceful Apsara dance is continued in this extraordinary school in Phnom Penh. Set up to offer a home and additional care to at risk children and teenagers from poor backgrounds, the not-for-profit Apsara Arts Foundation encourages youngsters to become self-determined individuals. 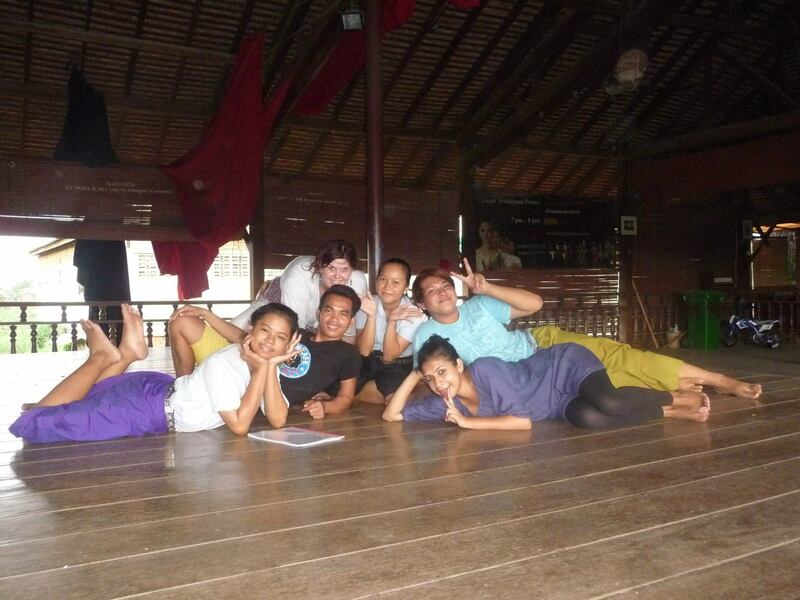 Children receive free Apsara and Khmer dance classes at the foundation, which is also a boarding home. Since 1998, the project has trained numerous girls and boys to become professional dancers who can now earn their own livelihoods. Depending on the day, you can visit the children as they train, observe and take part in one of their daily dance performances. The children are always delighted to meet people interested in both them and their art. You will be impressed by not only the dancing skills but also the enthusiasm of the children, who will be happy to teach you a few of the basic movements. Appreciation and applause is their daily reward. Head home reminded that there are no boundaries to friendship. Read more about Apsara dance classes in Phnom Penh. Flavors, whether inhaled or savored, alongside the colors of newfound ingredients, bring us a closer connection upon our exploration. What better place to enjoy this primal experience than in a local kitchen? 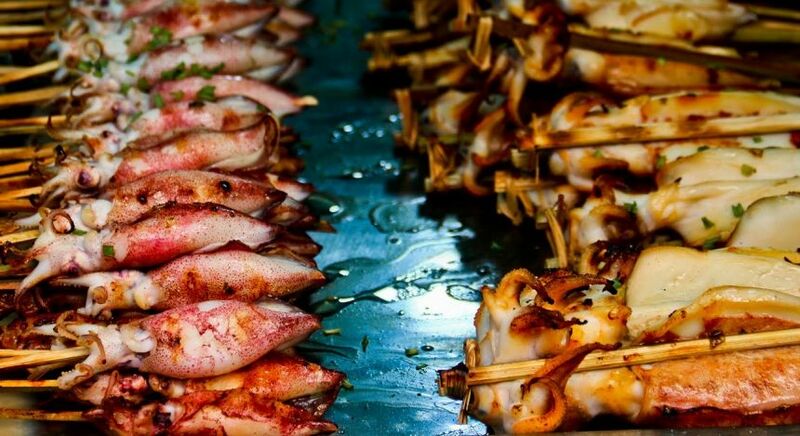 Standing next to its Thai neighbor, you may think Cambodian cuisine has little to offer, yet let us surprise you! Within this land of smiles, there is always a delicious curry to tempt your taste buds, especially those who appreciate a fiery and sharp dish, heightened with gentler aromas, unique to the country. 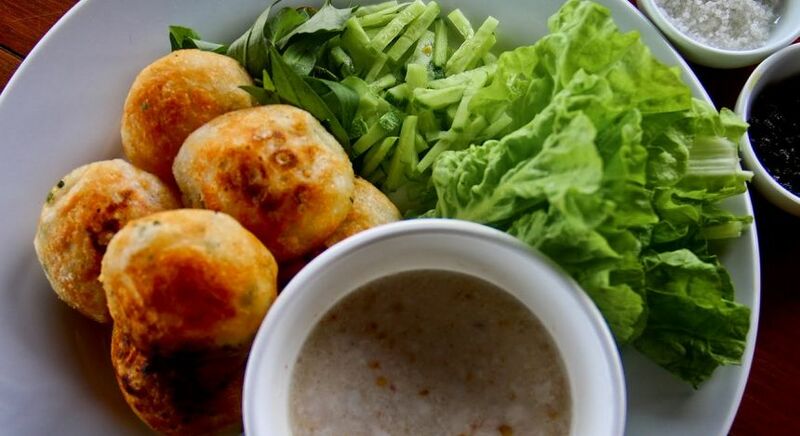 For an insight into Cambodian cuisine, we recommend you head to Sojourn Boutique Villas in Siem Reap. At Sojourn Boutique Villas, you can enjoy a private interactive cooking class. Begin with a short stroll through a village where you can gain an insight into the local cooking customs and ingredients. 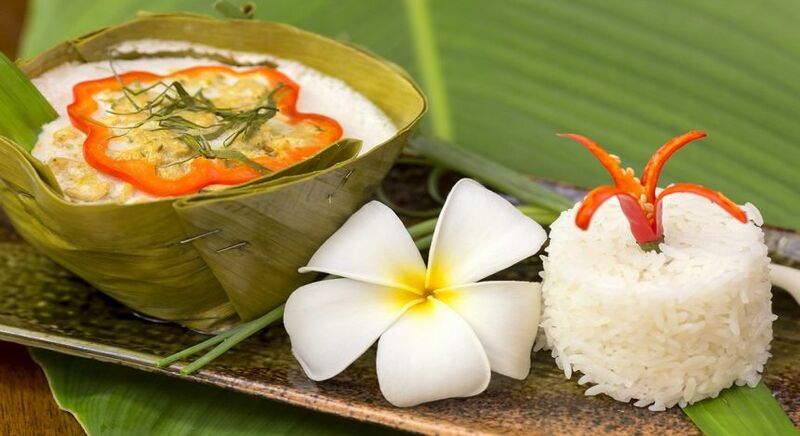 Discover how to prepare three authentic Khmer dishes during a hands-on experience within a stilted bamboo pavilion, before tucking into your delicious meal next to a romantic lotus pond! 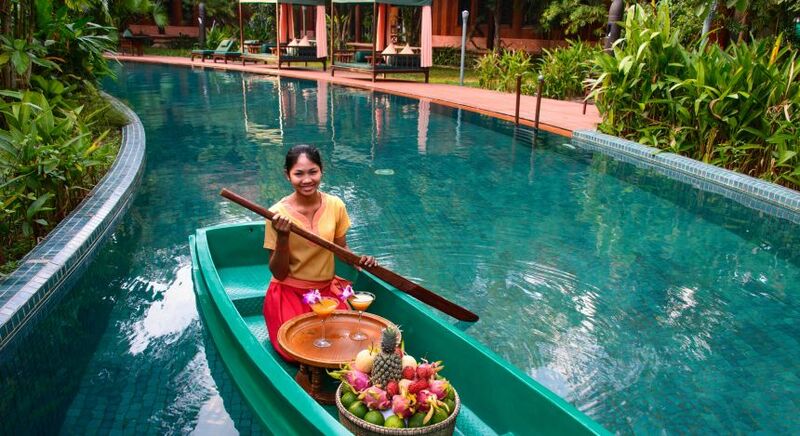 All our tailor-made journeys in Cambodia can be personalized according to your preferences. Contact us today for your custom Cambodia trip.